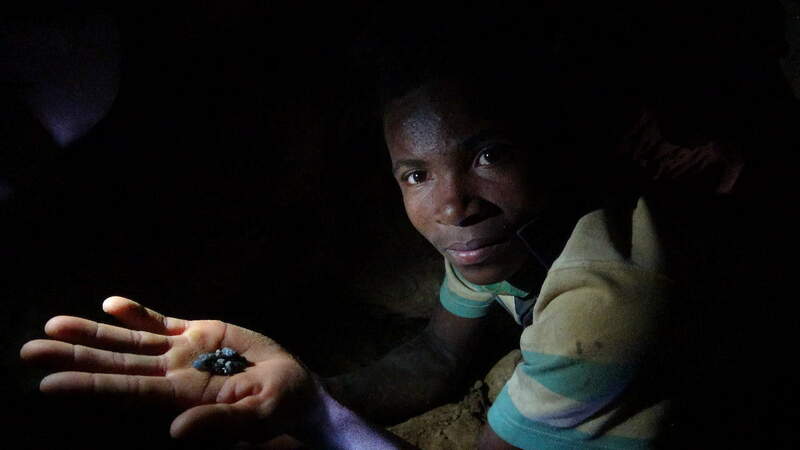 Miners of gold are working without government licenses in old, dry river beds in Niassa Reserve, Northern Mozambique. Dr Coleen Begg, who runs Niassa Carnivore Project explained to us that to separate gold with from other minerals poisonous mercury is used, and some is leaked into the river during the process. The Lugende River provides the local people with their main source of protein and if its fish stock is killed off – or reduced significantly – the local people are likely replace it with bush meat and so turn to poaching. Vincent Pardieu (GIA) wanted to fully understand the role of the miners in the context of conservation. While he was visiting Niassa so he accepted an invitation to join Niassa Carnivore Project’s scouts on patrol. I was fortunate to join them. We set off by truck and were dropped off near an old dry river bed, which the scouts suspected the gold miners would prospecting. The area is surrounded by relatively thick bush, with paths trodden down between the trees. After walking for several hours we came across mounds of gravel where Fernando, the head scout motioned for us to stop talking and the other scouts dropped their bags and crept forwards. What he heard could have been wildlife, poachers or miners…he moved on and saw a footprint in the sand. He followed it. 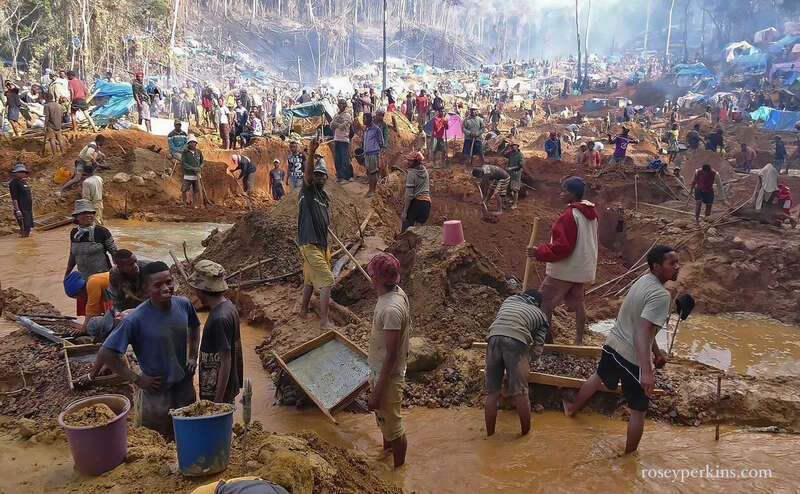 We hit the ground as the scouts moved on to find two men in tattered clothes, a bag of rice, a pot and some mining equipment including a carpet used to sieve gold, picks and shovels and a small bottle of mercury. It seemed a very humble way to live and a shame for them to face the penalty which can currently be up to 3 years imprisonment. We sat down to interview the miners who admitted to using mercury and that they were aware that gold mining in the reserve was illegal. Both had said they were there because elephants had destroyed their crops and had needed money.for food. Coleen works with the local village to provide crop protection solutions including elephant-proof fences. She installs swinging bee hives which deter elephants from crops and provides pollination as well as alternative sources of income including “elephant friendly honey.” She also provides scholarships for the education of local children. 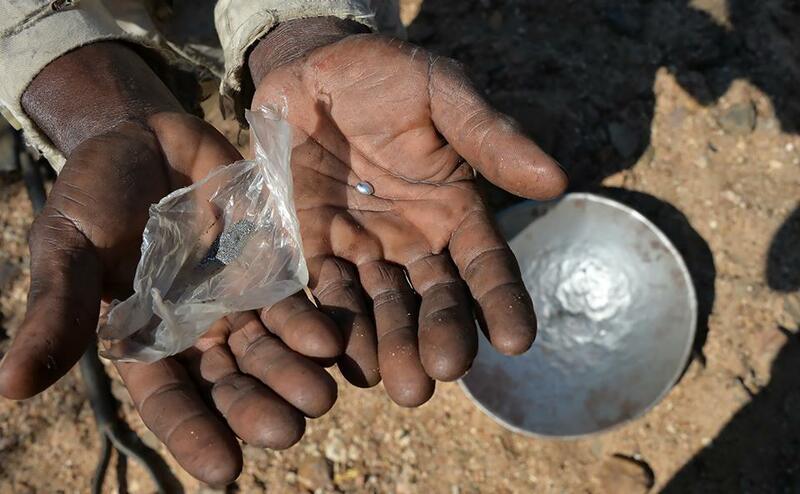 The current high price of gold makes Niassa’s resources a very tempting prospect. The scout team, Vincent and I set up our tents alongside the miners’. The nightly watch didn’t seem too vigilant – no handcuffs were used and there seemed to be good humour between the scouts and the miners. They were treated with nothing but respect. Mercury used for gold mining in dry riverbeds, Niassa Reserve, Mozambique. Photo: Vincent Pardieu/GIA. Morning came and the miners were still there, just shivering under their blankets. It had been a cold night so we were keen to pack up and move on. We found another miner in the same dry riverbed that morning and he joined our crocodile line, Fernando in front. Soon we heard a shout from a scout at the back. It became apparent that the two miners at the back had escaped. Fernando was bitterly disappointed and sensed disloyalty among his troop. Further down the river bed we came another two miners and chased one down. At his camp the scouts destroyed their equipment by burning their carpet and pick handles. They confiscated the mercury and some poaching tools. The miners had also been hunting the guinea fowl….but the scouts hadn’t finished the job yet. An hours walk later that scout asked to go to the loo. Two walked a short distance to a tree, one gained a few meters and they both fled – one to be caught again. Fernando was livid. Perhaps for a young scout to find and detain a village elder like he had done was too tough a challenge on his sense of loyalty. All of their young scouts were recruited from the village – all except Fernando – and consciously so. 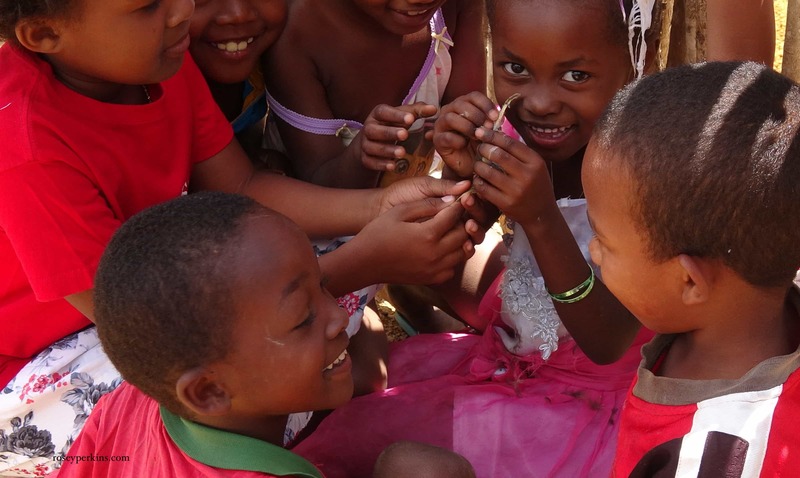 But the village is small, the scouts have many relatives there, the penalty for gold mining is high… The challenges Coleen and Keith Begg face to conserve Niassa seem constantly changing and support from locals often hard-won. Alternative sources of employment is something Coleen talked about a lot. Here is an interesting talk about Niassa by Dr Coleen Begg. Interesting articles on conservation and gemstones are here. This gem is found in the Melo Shell. I say “found”, but few are lucky enough to do so and Vincent Pardieu (GIA), who took us to meet a dealer had previous spent several days trying to find them, right at the source. He took us to a Melo collector and trader in Hanoi, who estimated that 1 in 10,000 Melo shells may contain pearls. They are often found by fishermen, who catch the large shells to sell the meat but so rare are the pearls, that fishermen seldom recognise them. Many Melo bare the scars of a fisherman’s knife. 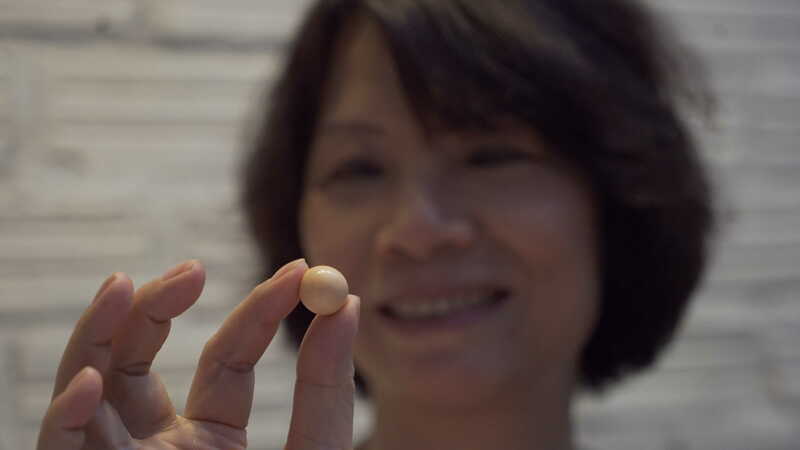 In order to improve her chances of obtaining these rare pearls, she travels to Ha Long Bay Island to teach the fishermen about them and how to find them. 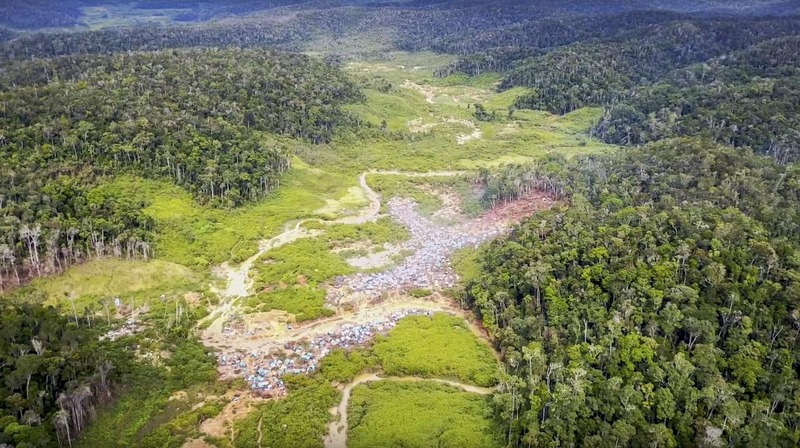 She says that many Melo pearls are taken out of their shell with the meat, and cooked before they are recognised….and tens of thousands of dollars burnt. One of the most impressive we saw was a pale yellow pearl. We were told that having been bought from the fisherman, it had changed colour over the course of a week. The dealer was rightly dismayed to see it become paler but as it turned out, the pearl had been marinated and cooked in soy sauce for several hours in the shell before it’s discovery. The paling was taking it back to its natural colour rather than a treatment wearing off….but there are treatments to look out for. Below is a large black pearl, which we saw in the same office and which Michele fell in love with. A week in a mining area is definitely an education and Yen The, in Northern Vietnam is one town with a lot to teach. Largely small-scale in it’s mining practises and innovative with it’s resources, it is a model mining town. 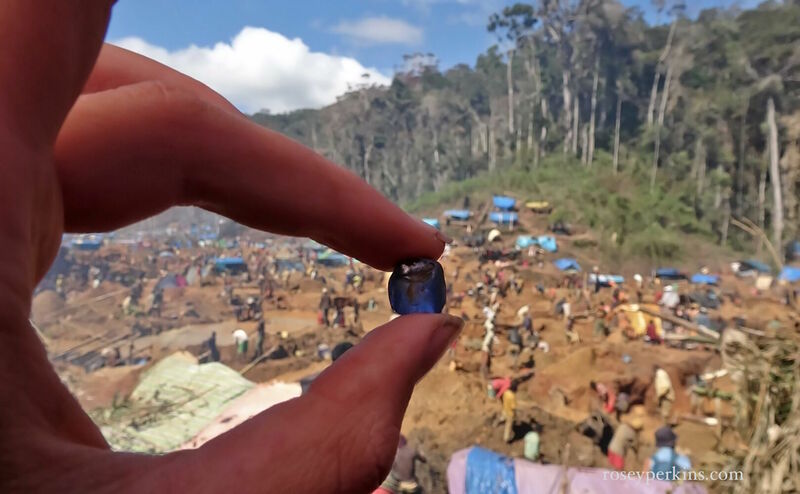 I travelled there with Vincent Pardieu, who makes frequent visits on behalf of Gemological Institute of America (GIA’s) field research department, and he kindly took me with a group of gemologists to the spinel and ruby mines in the area. A overcast morning in Yen The, Viet Nam. The dramatic mountains of Northern Vietnam are as impressive to the eye as the gems they hide and in less than 30 years since Yen The’s ruby deposits were discovered in 1987, it seems to have grown into a thriving hub of the Vietnamese gem trade. It produces rubies similar in colour to the Burmese ruby, cobalt (blue) spinel and bright red spinel, as well as tourmaline and (green) pargasite. What happens to the bottom 98% of rough? If gems are rare, gems of high enough quality for jewellery must be even rarer….and the vast proportion of stones found in the Yen The area aren’t of high enough quality to be used for jewellery. Lower quality rough can be used for sculptures and lower still can be used for emery paper but Yen The has also developed an art industry to use the low quality stones – i hope at higher profit. Their answer is Gem Painting. In Yen The low grade rough gemstones are ground into powder, sorted by sieve and arranged on glass or canvas. 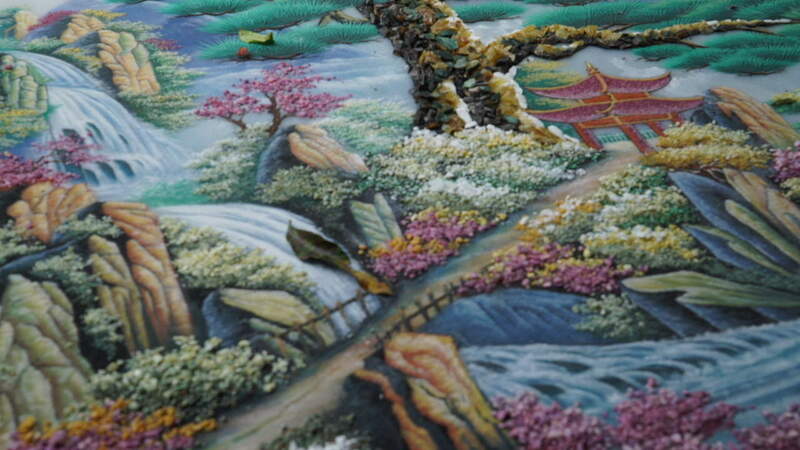 Colourful canvases depict scenes of Hanoi and symbolic themes reflecting Fung Shue beliefs. The textured patterns of powdered gems are distinctive and are sold to tourists and locals. Gem paintings are hung in many homes and business here to strengthen relationships or stimulate success. 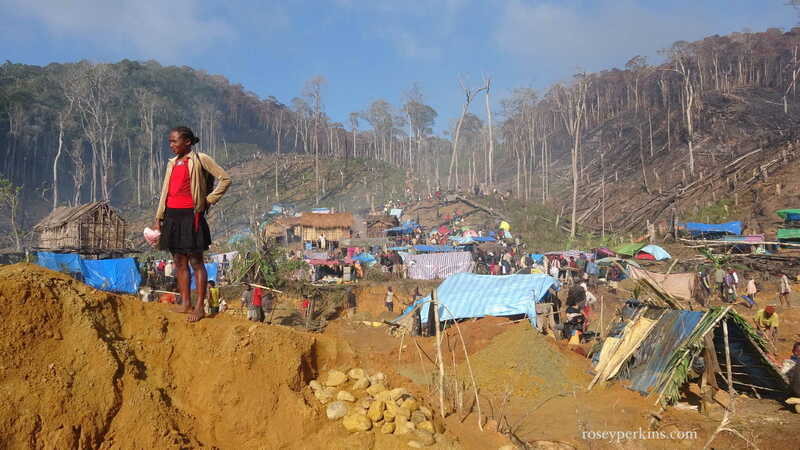 Women here play an integral part at every stage of the gem mining process. It is common for women to dig for gems alongside their husbands on their farmland. Women hold the majority of the trading stands at the market, and as for their gem painting, they are the gem grinders and the artists. Gem painting is not a job solely for women but it is a job which is very accessible to females, and this is particularly pertinent parts of the world such as Africa and Sri Lanka, where the gem trade is traditionally male-dominated. Local rough and cut stones are sold in the centre of town square, where any number between 10 and 30 women set up their stands every morning. Through shop windows, local people polish rough stones at cutting wheels, and jewellery shops sell finished pieces to tourists. Here, the gem’s path from mine to market can be condensed into a few kilometers. Gem painting is not a new idea, but it seems like a good idea for towns close to the mines to have developed this, especially since many miners lead a transitory life and often have to leave their families behind…I wonder where these gem paintings will find there homes.